Swiss Alps - Eurorail trip - with lot of wine. After reading the list top-to-bottom about 4-5 times and looking at my wallet, I decided this weekend I would go to Sinhagad fort, Pune - about 20 kms from where I stay. Sinhagad-ka-Quila. You also narrowly missed Death Valley while you were in Vegas dude.. This is better life than other states. That's a pretty good list and I have been to couple of places listed in the list :P.. Lucky me?? Btw I was checking my dead blog in xanga and i banged on to your blog!! you had commented on the June 27, 2005 post in http://cherishin-dream.xanga.com/ :).. Strange!! Yeah I am strange :)!! 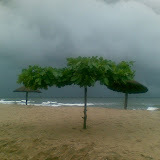 have u ever been to kerala, the god's own country.